Imagine stepping outside into the fresh air and sunshine to do a little yard work, fetch your mail and put together a picnic lunch. If this sounds like the perfect day, you might not believe that it’s actually a form of physical and occupational therapy. For older adults recovering from a medical event like a broken hip, enjoying outdoor spaces is now part of therapy at St. Andrews Village. As part of the recent addition of a 1,700-square-foot Community Living and Learning Center, St. Andrews Village has added two garden courtyards spanning more than 14,000 feet of outdoor space. Residents can reach the courtyards from anywhere in the community’s health care center. St. Andrews Village and Presbyterian Senior Living developed the new garden courtyards to serve as therapeutic outdoor spaces. They feature amenities like lush landscaping, benches, bird feeders, dining tables, raised gardens and a number of therapeutic components—all designed to enhance recovery and improve quality of life for seniors. Research has shown that simply spending time in natural landscapes can provide wellness benefits for seniors. A recent study in the journal Health & Place found that nature can boost both mental and physical health in older adults. The outdoor therapeutic spaces at St. Andrews Village go beyond the enjoyment of nature to provide benefits that affect seniors’ quality of life. Residents get excited when they leave the indoor therapy clinic and go outside, St. Andrews staff members note. 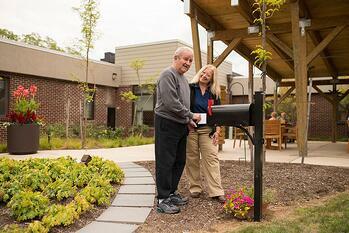 Moods become notably better, and residents feel energized and refreshed by spending time in the garden courtyards. By practicing real tasks that are used in everyday life, seniors maintain their dignity and increase their ability to function independently when they return home. The garden courtyards at St. Andrews Village are unique because they serve as outdoor therapy clinics. The outdoor spaces function as an extension of the indoor physical therapy gym and allow people admitted for short-stay rehabilitation to help guide their treatment by identifying physical challenges they will face once they go home. A variety of surfaces—including mulched and paved walkways, stepping stones, grass and river rock—give patients the opportunity to work on movement and navigation abilities. They practice tasks like hanging clothing on a clothesline, walking to a mailbox and caring for a garden. They also can choose to eat outdoors at teak dining tables. Seniors leaving a stay in a rehabilitative therapy center often encounter obstacles back home that can derail progress and negatively affect quality of life. By re-learning practical, physical skills in the St. Andrews Village outdoor therapeutic spaces, seniors get valuable practice coping with the challenges they’ll face in their everyday lives. Whether it’s stepping up onto curbs, retrieving mail safely, hanging out laundry, maintaining a yard or avoiding a fall on icy ground, seniors gain confidence that they can remain independent. Come Visit the Outdoor Therapy Spaces at St. Andrew’s Village to Learn More.